Presenting Icy, a handcrafted beaded bracelet by Tampa Bay designer Ashley Daniel. Look for other bracelets in this line featuring Ashley Daniel's brand mark. 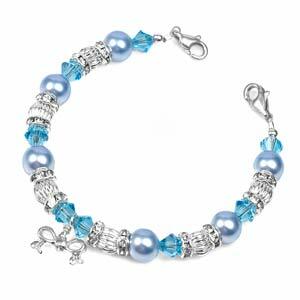 Bracelet is made of pearlized Swarovski crystals, glass rhinestones, and silver plated pewter bows and beads. Clasps are 316L stainless steel. Bracelet is available in 5, 6, and 7 inch lengths and attaches to any engravable tag you see on this page. Remember to add the bead length to the tag length to achieve total length of bracelet. Tag not included - please order separately. NOTE: This bracelet will attach to any of the tags you will see on the next page once you add the item to the cart.